Plywood is a manufactured wood panel made from thin sheets of wood veneer. It is one of the most widely used wood products. It is flexible, inexpensive, workable, and re-usable, and usually can be manufactured locally. 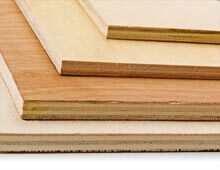 Plywood is used instead of plain wood because of plywood's resistance to cracking, shrinkage, splitting, and twisting/warping, and because of its generally high strength. Plywood layers (called veneers) are glued together, with adjacent plies having their wood grain at right angles to each other, to form a composite material. This alternation of the grain is called cross-graining and has several important benefits: it reduces the tendency of wood to split when nailed at the edges; it reduces expansion and shrinkage, providing improved dimensional stability; and it makes the strength of the panel consistent across both directions. There is usually an odd number of plies, so that the sheet is balanced—this reduces warping. Because plywood is bonded with grains running against one another and with an odd number of composite parts, it is very hard to bend it perpendicular to the grain direction. A typical plywood panel has face veneers of a higher grade than the core veneers. The principal function of the core layers is to increase the separation between the outer layers where the bending stresses are highest, thus increasing the panel's resistance to bending. As a result, thicker panels can span greater distances under the same loads. In bending, the maximum stress occurs in the outermost layers, one in tension, the other in compression. Bending stress decreases from the maximum at the face layers to nearly zero at the central layer. Shear stress, by contrast, is higher in the center of the panel, and zero at the outer fibres. Jacobs Joinery use a range of different materials when manufacturing bespoke furniture and fittings - this includes timber, synthetic materials such as Corian and veneers. See our Projects Gallery.